Doing So Is Tougher Than Ever, So Why Are More Americans Renouncing Citizenship In Record Numbers? As the adage goes, the truth is in the numbers, and the truth is there are more Americans renouncing their U.S. citizenship than ever before. The number has risen from 932 citizens in 2012 to an all-time record number of 4,279 for 2015, estimates that come directly from the U.S. Treasury Department. The Federal Register projects even higher numbers for 2016, estimating 5,986 individuals will have taken the oath to renounce their citizenship. Why are people who have such a sought-after citizenship, one that comes with a host of benefits, including freedom to travel and work in the United States, ever seek to opt out? When so many people in the world are doing the impossible to get into club USA, often risking life and limb on long journeys to get to a country where the path to naturalization is fraught with obstacles, why is a select group of Americans willingly giving up their status as citizens? To understand what’s leading Americans to renounce their citizenship, it helps to look at the number of Americans leaving the country to live overseas. In 2011, the official estimate of number of American citizens overseas was of roughly 6 million people. For 2015, State Department officials made known to the Association of American Retirees Overseas (AARO) that the number has risen to around 8 million people. As this graph shows, the number of Americans moving overseas has been following a steady upward trend since the late 1990s. While there aren’t any officially stated reasons to explain why this is happening, many sources cite the United States’ ever increasing cost of living, including ludicrously inflated medical care costs. For a person about to retire on Social Security or a fixed pension, trying to make ends meet can become as onerous as to push them to seek moving overseas as a viable solution. Obtaining and paying for health care is a primary concern for many U.S. citizens, whether living abroad or not. Today, terms like “medical tourism” are trending, driven by the fact that American health care is in crisis. Public health: Life expectancy in the U.S. is a few years below the average of other high-income countries in the OECD, and, for some parts of the population, life expectancy is falling. Infant mortality is above average and there are higher incidences of death by breast and prostate cancer. Health inequality: When looked at through the lens of race and class, gaps in public health care services are shockingly large. The quality of and availability of services tends to increase the better off you are socioeconomically. Health care cost: America’s health care is by far the costliest in the world, far above those of other countries. In 2015, a whopping US$9,451 was spent per person on health care in the United States, according to the most recent data from the Organization for Economic Cooperation and Development (OECD). In Luxemburg, the next country with the most expensive health care costs, US$7,764 was spent per person. Sachs makes reference to a recent study of America’s soaring health care costs in a 2012 federal government report by the Institute of Medicine (today called the National Academy of Medicine). According to the government’s own findings, the higher health care expenditures in the United States are not due to a greater use or higher quality of those services. Instead, it is directly attributed to the higher prices of health services, including drugs, hospital stays, outpatient visits, and medical procedures. All of these products and services simply cost a lot more in the U.S. than their counterparts do in other places around the world. In the face of all these matters, the number of average U.S. citizens looking to escape a high cost of living has shot through the roof. For some, relocating overseas has become the answer to their concerns. Yet, no matter where in the world one goes, escaping the long arm of the U.S. taxation policy is not a simple matter of hopping on a plane and relocating to an offshore haven. 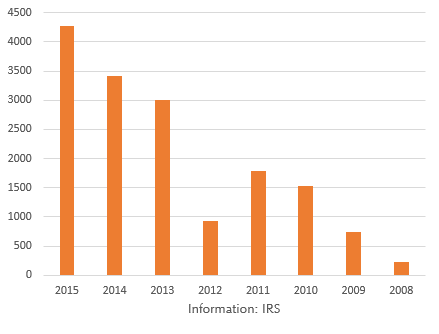 Flouting this upward trend of Americans moving overseas year after year is the Foreign Account Tax Compliance Act of 2010, also known as FATCA. The law, ostensibly enacted to target American taxpayers who use offshore banking havens to avoid paying taxes, has made it harder for Americans living overseas to open bank accounts because of the added requirements for foreign banking institutions to report any American account holders to the IRS. The difficulties that the new law has brought to bear on Americans living overseas might lead one to believe that less numbers of U.S. citizens would be willing to move away from their homeland on an extended or permanent basis. But, as the numbers show, it hasn’t. On the other hand, it could help explain why more Americans are choosing to relinquish their citizenship. As FATCA underscores, no matter where you live and where you make your money, regardless of how much time you’ve lived outside the United States (even if your entire life), if you are an American citizen, you owe the State taxes on anything you earn above a certain threshold. As of this writing, Americans abroad can exclude up to US$100,800 per year of their foreign earnings as reportable income to the IRS before said earnings are subject to taxation. FATCA expands the reach of the IRS, placing a considerable burden on foreign banks to identify U.S. customers to U.S. tax authorities. Penalty for failing to comply can be as high as 30% of all a bank’s dealings with the USA. All despite the fact that the requirements to apply for a personal bank account are more stringent than ever. The amount of paperwork can be staggering and fees are often high, with some banks even charging around US$200 a month for their services for U.S. citizens. Opening deposits can range anywhere from US$5,000 to the exorbitant amount of US$100,000—just to get your bank account up and running. For people that have any business concerns outside the U.S., this can mean real trouble. The common trait this group shares is that they are citizens of countries other than the United States, and though they may be considered U.S. citizens under U.S. nationality law, most are not aware of their status and some only find out during adulthood. These folks may have lived all their lives outside of the U.S., but as far as Uncle Sam is concerned, they still are responsible for paying their share of U.S. taxes. The reason comes down to U.S. worldwide taxation policy. The only requisite to pay global tax to the IRS, no matter where in the world you live, is being born an American. That’s it. So people who have dual citizenship, even if they are “accidental Americans,” still have to pay taxes to a country they haven’t even lived in. The fact is that the only other country in the world that shares a similar taxation policy—based on citizenship as opposed to residence—is Eritrea, a tiny country in the Horn of Africa bordering the Red Sea. Because of FATCA, a citizen of a non-U.S. country who find himself is still responsible for complying with all the paperwork required by the IRS, even if they don’t meet the income threshold to have to pay taxes. Of these dual-citizens already enjoying the benefits of their non-U.S. country, these filing requirements can appear not only unnecessary, but overreaching. As expressed in a letter published by Forbes.com in an article entitled, “Dear Mrs. Obama, Why I Gave Up My U.S. Citizenship,” a former citizen detailed how her frustration at the U.S. taxation policy led her to make the decision. For starters, the citizen renunciation fee now comes to US$2,350 since November 2015. That’s an increase of over 400% in comparison to the last price. As if that wasn’t enough, there’s another, sentimental price that must be paid. The process must be done in person, in front of other Americans, specifically the State Department officials at the U.S. embassy for those who reside overseas. Afterwards, your real name must be published in a federal register. Either way, these rather Dantesque measures haven’t appeared to stop Americans expatriating or renouncing citizenship. Until a study is conducted that specifically looks at what is motivating people to take the drastic step of renouncing their citizenship, we won’t know what is actually undergirding this upward trend in numbers. So far we can guess that renouncing has far less to do with political inclinations or extremist views and a lot more to do with asset protection and a sense of economic parity. The obstacles the government has put in place for Americans to opt out of citizenship are tougher than ever. Folks who go through with the process must be steadfast in their efforts. Will the country’s new administration be able to effectively address the concerns that are driving U.S. citizens out of their citizenships? If past performance is any indicator, 2017 promises to see more Americans doing so than ever before.